The 54 slide presentation is also worth a quick glance to understand the political undercurrents that have shaped up over the last three months, PPP and Asif Zardari on a popularity decline to 9% and Nawaz Sharif leads by a massive margin at 55%. 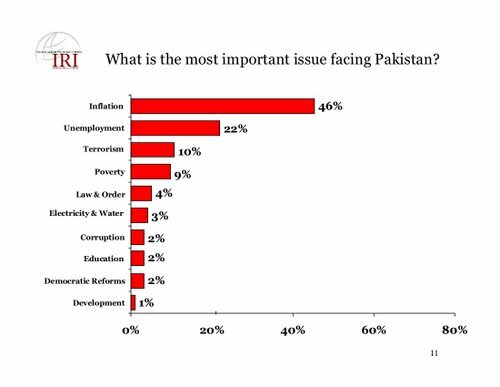 To the questin on What is the most important issue in Pakistan – shows that an overwhelming majority felt that Inflation [46%] and unemployment [22%] were far more important then terrorism coming third at a distant 10%. 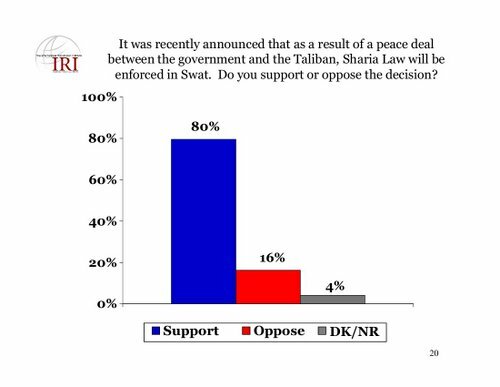 Granted this is an opinion carried out in March, probably just before the northern areas in Pakistan nose spiraled out of control, what needs to be noted that most people do not favor a military intervention whilst quite a large majority of the polled population believed that Sharia should be enforced in the region. I guess the media needs to come up with more flogging videos and more and more people would be favouring the bombardment of Talibans. Then they would retaliate and more and more people would die. Then the Govt will do another operation……..
and then they would retaliate……………..
Who is the sucker here? The whole Pakistan. I doubt it shows the opinions of most of Pakistan but if it does looks like they still haven't learned their lesson of democracy i dont blame America or anyone if Pakistan breaks up if Pakistani themselves are not against extremism and want to do peace deals with the people who want to kill them and promote American agenda in Pakistan. IRI is known Recipient of grants from National Endowment for Democracy. NED is the same organization which has been proven to destabilize countries. Venezuela is case in point. IRI is one of NEDs core organization. A sample size of 3500 being used to generalize the thoughts of 170 million, wow. If anything, the operation should’ve started much sooner or we should have the tribes handle this threat, but that time is gone and we need to act now. Why don’t you bring up a survey of the displaced people and ask them would they rather live under that threat or flee? 4) Terrorism/Extremism is more propogated than present!! the media and liberals, eh teeth? so which side of the liberal conservative divide do you fall on? The operation would be a really bad idea if the army loses and it drags and and on. Public which is so gung ho now will be against the operation if it is not sucessful. Pakistani army has never won a war except in Lal masjid. Doubt they can pull this off. Time will tell. If the army wins, fine. But if the cant control swat at the end of this operation, Kayani & Co should be fired. Its thier reponsibility to figure out if the operation can be sucessful before getting caught in it. People must pay for their incompetence and impotence. People must pay for their incompetence and impotence. This will remain a dream in pakistan where you can get away with anything you do. We have so many traitors in our parliament and our political parties; some in dubai; some in london; none is taken to account. Ofcourse I will yell at the army when the damn taliban hit my family. They made the taliban, armed them, brainwashed them with jihad..
made them more determined then themselves..
then did panga with them when the dont have the nuts to finish the job. They better finish the job.. ow.. they should be strung up..
1) IRI has generally been pretty credible so far. Their statistics correlated with election results very well. 2) The survey was conducted before the Peace Deal was scrapped. Hence there will be a bias in favor of the Peace Deal since the media was kind enough to claim it would work. 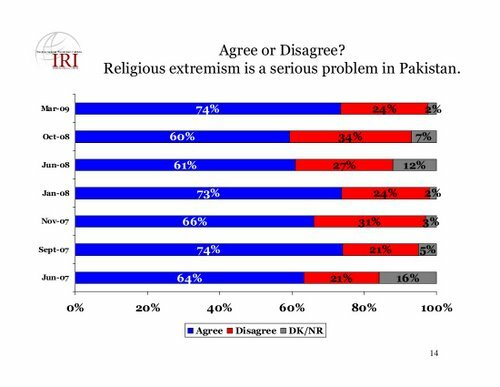 3) More number (74%) of Pakistanis identified religious extremism as a serious threat than Oct (60%). 4) More people identified Al-Qaeda and Taliban operating from Pakistan as a threat(69%) than ever before. 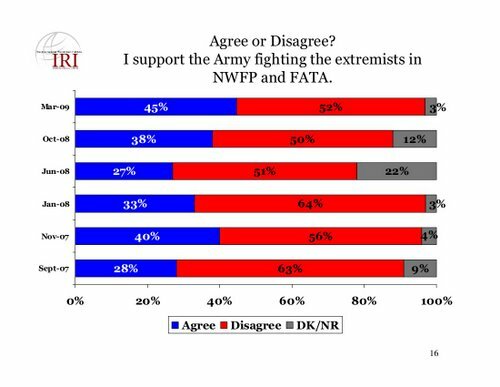 5) Support for military operation against the Taliban is at the highest it has ever been (45%). 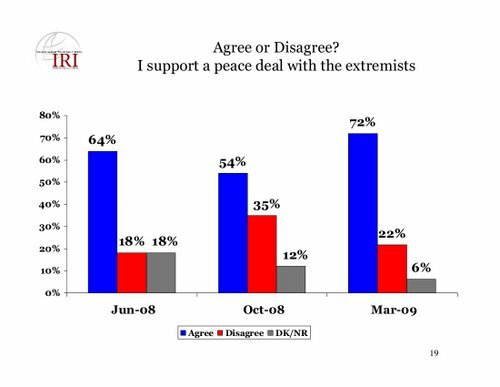 If a survey was conducted today, it would have a higher number than this since this one was conducted pre-Taliban violation of peace deal. 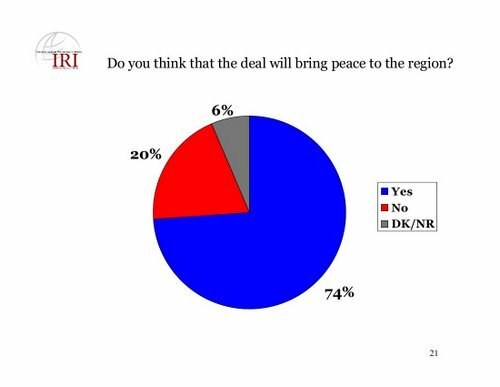 6) 73 % of people thought peace deal would strengthen Taliban. 53 % of people thought peace deal would strengthen Al-Qaida. 9) Only 3 people have more liked than disliked. These are Nawaz Sharif, Shahbaz Sharif and Iftikhar Chaudhry. Imran Khan is 4th with 1 % more people disliking him than liking him. 10) Zardari is still the most hated Pakistan (72%), more than Altaf Hussain (70%), Ch Shujaat (70%), Asfand Yar Wali (69%), Pervez Elahi (69%), Baitullah Mehsud (66%). 11) PML-N seems to be heading towards 2/3rd majority again in next elections. They are the most popular party Nationally and in all provinces except Sindh where PPP is still the most popular. 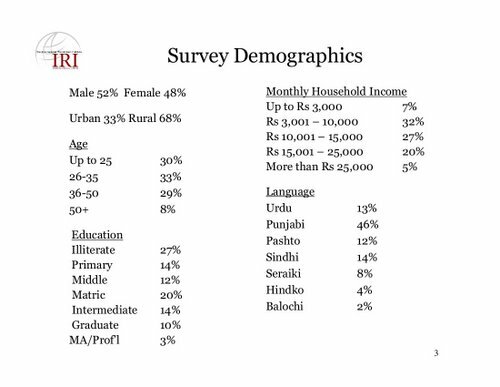 13) Imran Khan and MQM are only popular in 3 % of the National vote bank. Quite agree with you. Its ridicolous that we even talk about the writ of the government when all the government does is exploit the masses for the benefit of a few. I wait on the road while some moron moves about in a convoy. Why should I wait for some bloody VIP. Inconvience hundreds for one moron. Well sometimes I get out of the car and curse the moron on the top of my voice asking other motorists to join me. Its Funny that the Cops actually apologize to me saying they dont like it either. Qabza groups dont let go of my family properties. This is the writ of the Government? what the hell is this? Writ of the Government is doing a deal so Zardari can loot and go scott free. And I paid **** load of taxes and I get audited. Each step has bloody red tape with it and I have to wait in line. And the bloody VIP does not have to do go to any lines. This kind of unjust society cannot and will not and frankly does not deserve to survive. Survey or with out survey, Killing your own people does not make sense. On the asking of USA we are destroying the most simple people in Pakistan as well as our first line of defenders. hummmmm…that is interesting after such a intense propaganda,flogging video, beheading videos etc etc etc..
Teetho, I hope you didn't block my IP as I wasn't able to see the comments until I changed my IP. I hope you are not running a censor board at your blog. The condition of people of swat is like Paletinians. The same people who took away their land provided them with refugee camps and even provided them special 'refugee' visa to live in any land but their own. all we do is rant and rant; we do nothing concrete to rid ourselves of these feudals. part of the problem is that these b******* in the govt have so much screwed the common man in little things like unavailability of jobs; petrol prices; feeding the family and what not; that the people do not have the time to rise against the govt. ask any one on the road how to fix the situation and he will be like "chal raha hai chalne do jesa bi hai". we need to get rid of this mentality and hang these feudals by their pair outside the parliament. if the people dont want change; well whats the shouting about…?